is conducted by Educational Assessment Australia, UNSW Global Pty Limited. Students from twenty countries now participate in ICAS. Cantamath has two main categories. The first one is the team competition. Teams of four students answer a series of challenging mathematical questions and they are literally racing the other teams to be the first to complete all the questions. Every year Kirkwood Intermediate enters 1 Year 7 team and 1 Year 8 team. The students who have strength in Mathematics get extended and trained throughout the year and the teams are selected in Term 3. The other category is Mathematical Displays Competition. Students submit written, design, construction and even wearable mathematical displays related to a mathematical theme. There are a number of categories and selected work entered is displayed in the Town Hall. This is a mathematical problem solving competition aimed primarily at intermediate school students. It is organised by members of the Department of Mathematics at the University of Otago. Students participating in the competition attempt to answer five questions in 30 minutes on each of five problem sheets. All Kirkwood students get an opportunity to participate in this. This is a mathematical problem solving competition which has more than 35,000 students participating in Australia and New Zealand. Kirkwood Intermediate School provides this opportunity to the students to extend their problem solving skills. Students attempt to answer five questions in 30 minutes on each of five problem sheets. World Maths Day is an online maths contest. Students get one minute to answer as many numeracy questions as they can. The level of difficulty is approximately age appropriate. When playing a game, the website will attempt to find other players of the same level around the world to match the player against. Students can play at home and at school against other students around the world in live games of mental arithmetic. There are many opportunities for students to have their work published. Any student who wishes to send their work away to various publishing companies such as Learning Media (School Journal) can approach the teacher in charge of Literacy for more information with regards to this. There are also many competitions that are advertised and provide students with the opportunity to have their piece of work published. This is an annual event held nationally. Regional finals are held throughout New Zealand and a the winning team from each region goes forward to the National Final. It is now an international event with teams competing from all over the world. Last year the International final was held in Scotland. This is a national competition. The children get a chance do different activities each year (locally) and also vote for what they think is the children’s best book in the awards. 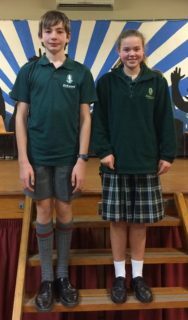 Both Ruby and Lachlan represented Kirkwood extremely well last night at the Rotary Speech Competition held at Merrin School. The level of competition was high this year and they performed admirably. A further congratulations to Lachlan for winning first place. What a great result! Congratulations to both our teams – achieving 2nd and 3rd place means we go through to the regional finals. Kirkwood Genius’s (Sophie (leader) Cayden, Kane and Dante) built from scratch a moving vehicle that was remote controlled and had to travel 2m while holding up a balloon at the same time! Kirkwood Wizards: Aarya (leader), Amad, Ethan and Finn. This team used the talents of individuals really well. Both teams did really well in a variety of difficult challenges. Thank you very much to our supporters – Ms Anderson who helped make afternoon tea to nourish people before the long event and Alisha who was reserve and supported both teams. Our Engineering team (Jess, Liam, Cameron and Vincent) entered a Swimming Pool Temperature Probe App Project at the Canterbury-Westland Schools’ Science and Technology Fair which was held at Ara last year. They won the Statistics New Zealand Award for Excellent Use of Statistics. Four students at Kirkwood Intermediate designed and built an electronic sensor and mobile app to free the school’s caretaker from taking hourly manual readings of the swimming pool’s temperature. Electrical engineer Chris Baddock from MWH mentored the team and guided them through the product development process. The students started with meeting their client – the caretaker – to establish what he wanted from the project and how the temperature information would be presented to him. They decided on a smartphone app that updated in real time and could be checked even when the caretaker wasn’t on the school grounds. The team then researched and analysed different varying measurement techniques before designing their electronic device. It included components to measure, process and display the temperature data locally, and a Wi-Fi module to transmit the data. 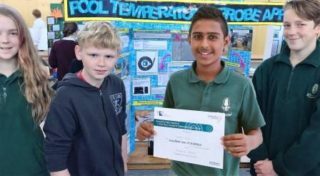 During the construction and testing phase the group entered their work in the Canterbury – Westland Science and Technology Fair, where they gained a merit award form Statistics new Zealand for ‘Excellent use of statistics in a science project’. “Chris made the learning as practical as possible,” says teacher Julie Anderson, “with students testing design ideas and making modifications to improve performance. He also discussed the impact an engineering career can have on improving the quality of individual, family and community lives. 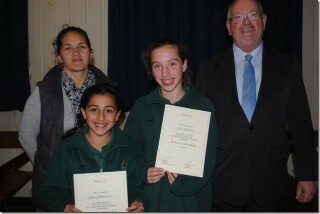 Congratulations to our two speech contest participants. Salma gave an excellent speech in the Year 7 competition but was unplaced whilst Jorja won the 2015 Year 8 Riccarton Rotary Speech Contest – an excellent first place. We are so proud of both our students. Rugby Sevens Bronze Elite 1st Canterbury Metropolitan Spring Seven’s Tournament.